Today was another unpacking day. Until today, I actually don't think I've done much unpacking in the last few weeks. It was supposed to be "tax & to-do Tuesday" — but it took all day to find the right box that contained the paperwork I needed to do the taxes. In the meantime, I sorted loads of other papers and books, and soon I will be able to remove my silly post-it notes that tell me where things go. I'm feeling more settled, and I found my MAF Doves music, which makes me feel SO much better about auditioning for the church worship team coming up soon. There's just something about having my familiar music with my own wacky notes on them. So now we have our work cut out for us to actually finish up the taxes. And tomorrow I have my women's Bible study group. Thursday morning I'm going to a women's writing group at church, and we are looking forward to hanging out with friends (some old and some new) in the afternoon & evening. On Friday a new friend is coming over to listen to me practice what I will say for my (small) part of the panel at the Trinity Women's Retreat coming up soon. (I'll be talking about the ways that God was faithful through Timmy's life and death... and the fabulous part is that I have so many things to say that I'm going to have to be careful not to talk too much!) The movers are going to come pick up the empty boxes on Friday too. That should help give us some space! Saturday I have 2 different events for the career actions ministry I am a part of to help me learn job hunting skills and network in the area. And Saturday night we are going out for the church's "great dates" night. Life is definitely busy for us these days - and I don't even have a job yet! But I've made progress by going to job hunting seminars, editing and re-editing my resume, cutting my hair, checking out dog walkers and doggie day cares, and buying a new suit. So now we'll see what the Lord has in store! 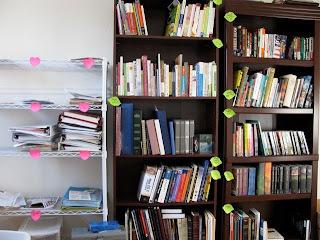 In the meantime, I'm thankful to have time during the day to organize the office and get involved in our church. Thanks to all of our friends and family who check in with us from afar. We appreciate you — especially as we are still settling in to our new life here. 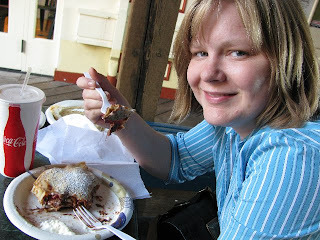 For our first trip into San Francisco, we decided that we needed to have crepes at Pier 39. Yum!!! 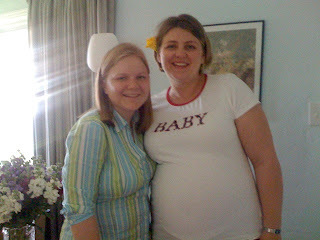 Last Thursday I got to attend a baby shower for my new friend, Masha. 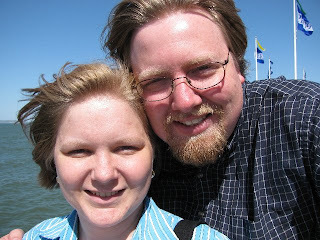 She used to work with the Learning Technologies group at MAF before we got there, so a mutual MAF friend introduced us.